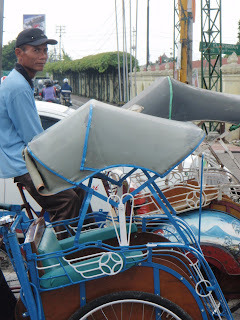 We’ve spent almost two weeks in Central Java, based in Solo (Surakarta), the city where Tom lived. Even with previous visits, even with years of third world experience, even with modern technology, we are sort of shell shocked. Solo is the cultural soul of Java, known for its refinement, classical music and batik. A city of a mere half a million people, a sliver of the size of Jakarta (10-15 million) in an extremely diverse country of 225 million. It’s noisy. The quiet bicycles and becaks (passenger carts mounted on the front of bikes, driven by sinewy drivers) are being replaced with motor bikes and private cars. You drive a motor bike until the family consists of Mom, Dad and two school age children. Then it is time for a new SUV. It’s dirty. But not as filthy as 20 years ago, when sewage ran in the streets. It’s hot. Rainy season has begun with mammoth long gully washers. We are among the biggest tourist attractions around. Indonesians on holiday throng to take our photographs, preferably Amy with their children. About 70% of the population is Muslim. The call to prayer comes five times a day over the public loudspeaker system. There’s a lot of “come hither” purdah – veils in fashion colors, sometimes with sparkles or other ornaments – fulling covering the hair, ears, neck and shoulders but exposing the full (and often heavily made up) face. Surprisingly, the rest of women’s normal attire is standard Western autumn – dark colors, jeans or leggings, tops with sleeves, flip-flops or sandals being the only concession to the 95 degree heat. After initially being taken aback, you quickly come to realize that Muslims are “just folks”. There does not appear to be any pressure for others to conform, at least not now. The rest of the population - Hindus, Buddhists, and Christians - claim they are treated with tolerance and respect. That was the official order of the day during the strong-arm regimes of Sukarno and Suharto. Today, one of the scary aspects of the burgeoning democratization of Indonesia is local government initiating new ideas ranging from optional women-only train cars to sharia law. People seem delighted that we are from America (we were more than a little worried about what would happen if those idiots in Florida went ahead with their Koran burning). Solo is supposedly a hotbed of fundamentalist training camps but the only anti-American thing we have seen or heard was, among many other tasteless trinkets, Uncle Sam hanging in effigy on a keychain. Our visit has coincided with the end of Ramadhan. While there has been a lull in the performing arts, it’s been quite interesting. For a month, observant Muslims wake in the middle of the night – 2:30 am or so - and eat a big meal before sunrise. They do not eat or drink all day. They at least nominally go to work. After dark, they break the fast and do a lot of socializing late into the night. Like Christmas in the West, Ramadhan is the time for consumption in the form of gift giving, new clothes, and culinary indulgence. Though alcohol can be found in the form of Indonesia’s formerly ubiquitous beer Bintang, it is not listed on menus in this city. It is either barely tolerated, in short supply or rationed – we can’t really tell. At the end of Ramadhan is Idul Fitri, when everything closes for at least four days. Can you imagine transportation on a holiday on an island of 125 million people with lots of new motor vehicles? We were warned. We planned accordingly – hiring a car and driver to take us to us up into the mountains about 80 miles away. It was virtually a non-stop traffic jam – 16.5 hours – with every vehicle – bus, minibus, private car, scooter- filled to over capacity. Unlike the violently shivering people on motorbikes, at least we were dry in the torrential rains that looked like they would wash down the side of the mountain. We had a very experienced driver who could negotiate the four lanes of traffic on the vertiginous two lane roads. The vistas of that day will last us a lifetime. The trip itself – well, it made a mere sail across the ocean feel pretty tame.